Digi-Schlock: THE BABY (Severin DVD & Blu-Ray) – Schlockmania! 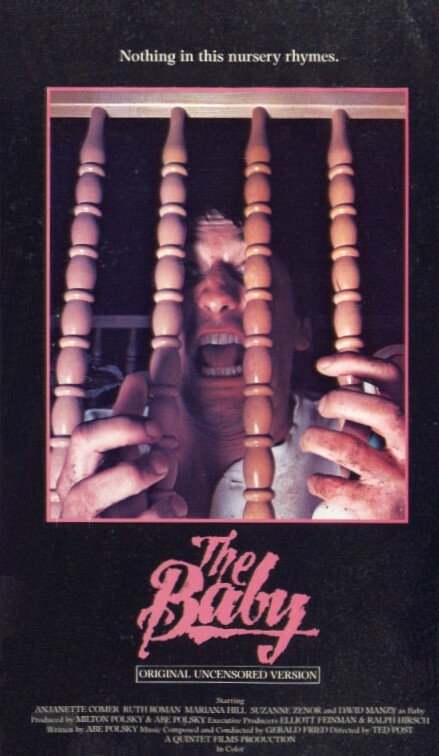 Of the trio of recent Severin Films horror DVD releases, the most interesting and cult-ish of the bunch is The Baby. This underrated gem was released on VHS back in the day and has been in and out circulation in recent years since it was released on a now out-of-print disc from Image. That transfer has been revived by a few grey-market outfits, none of them ever improving on its decent presentation of this film. Thankfully, this new Severin disc not only does justice to this film from an A/V standpoint, it also throws in a few cool extras for additional value. Severin’s edition of The Baby offers a fresh HD transfer of the film, presented in an anamorphically enhanced 1.78:1 ratio. The earlier, oft-recycled Image transfer was a full-frame affair so owners of widescreen t.v.’s will appreciate the anamorphic upgrade it gets here. Simply put, this new disc looks gorgeous: the detail is sharp and the early 1970’s color scheme have an appropriately vivid, earthy look. Unless Severin releases a blu-ray of this title at some point, this is probably the best this film will look on home video. The mono soundtrack is maintained for this transfer and it has a nice, crisp sound to it. Severin has also assembled a few unexpected extras for this title. The first is an audio interview with David Mooney, a.k.a. David Manzy – the actor who played the title role. He’s both informative and genial as he discusses how he got the role, what it was like to work with the actresses and how people have responded to the film over the years. The only quibble with this engaging segment is that it cuts off in the middle of a story at its close. There is also an audio interview with director Ted Post, conducted via phone by documentarian Elijah Drenner. If you ever wondered how this mainstream director of t.v. and films got involved with such an odd indie project, you’ll get your questions answered via this chat. Post freely admits that the writer/producer of the film had to work on him for a year to talk him into doing the film and discusses how he formulated his take on the film’s characters and psychology. Post is a lively and opinionated speaker so the result is a pretty engaging listen. The package of extras is rounded out by a set of trailers. The first is a memorable hard-sell for The Baby: newbies should watch this after the film as it gives away some key plot points but fans of exploitation film trailers will be amused by its gleefully lurid approach. There’s also a trio of trailers for other Severin horror releases – one of them is a memorably unhinged trailer for the Italian flick In The Folds Of The Flesh. To sum up, this disc not only offers a great new transfer but also a few cool extras that shed light on the film’s mysterious history. It’s also got a nice catalog title-level price so horror fans have no excuse to buy a grey market edition over this. Simply put, this new edition of The Baby is the version to get. Blu-Ray Update, 7/2014: Severin has taken their quality release of The Baby to the next level by reissuing it on blu-ray. The high-definition transfer looks very good here: though the black levels might feel a little pale, this transfer handles the frequent night scenes and dark interiors beautifully and perks up the colors in a few key spots (most noticeably Baby’s birthday party). The celluloid texture is retained without being overbearing and the lossless mono mix that accompanies this transfer sounds robust, particularly in its use of Gerald Fried’s score. The extras from the DVD are carried over. All in all, a worthy high-def upgrade for lovers of ’70s bizarro cinema.